It’s lovely receiving gifts from Biore once again and this time they send a bottle of their new Marshmallow Whip Facial Wash Acne Care which was rested on soft fluffy “clouds” in the box. Their new Marshmallow Whip Facial Wash Acne Care is suitable for Acne-prone skin as it contains anti-bacterial ingredient to reduce the chances of bacteria trapped in the pores of our skin to cause skin inflammations. 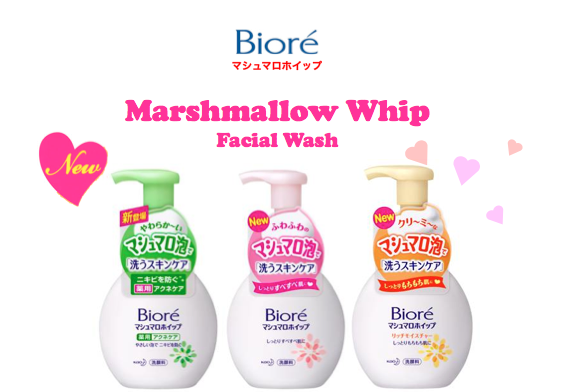 Of all the various types of Biore’s facial wash, I find the Marshmallow Whip series to be one of the best in terms of cleansing the skin thoroughly without stripping off our skin’s natural oil. The foam produced is so refreshing,light and bouncy that you would just look forward to cleanse your face every night with this fun marshmallow whip facial wash. Even as I am entering my mid-twenties, my skin still do get rather oily sometimes especially at the T-zone areas. My skin condition didn’t get any better when I have enlarged pores which clogged easily Dirt and bacteria could easily accumulate and get trapped in pores if they are not cleansed properly. So that is why for people with Acne-prone skin, it’s crucial that we carry out a deep cleansing step using good facial cleansers with deep cleansing action like Biore’s Marshmallow Facial whip to effectively cleanse the pores. With just one pump, the ultra fine foam could be swiped across the face smoothly while cleansing. It’s gentle on the skin as it prevents excessive pulling and tugging on the skin when you massage the face in circular motions to cleanse. What’s best is that you don’t have to spend time and effort generating foam from the product for easy cleansing of the skin. All you need to do is to squirt out some of the foam from the bottle of marshmallow facial whip and apply directly onto the face. After using this product, my skin feels smooth and supple. Of all the facial cleansers in our local drugstores, this facial foam is one of the most gentle facial cleansing foam which has a deep cleansing action. Have fun with the bouncy foam! Boing-boing!